In last week’s post, we alluded to questions that may well become much more important — or policy relevant — in the next few years. That is, there is a hitch in the existing foundation funding formula, which has only been exposed over the past couple of years. In 2004-05, when the current funding formula (developed in the 2003-04 Lakeview Special Legislative Session) was first implemented, the local revenue generated from the required 25 mill local property tax (otherwise knows as the “URT – Uniform Rate of Tax”) was less than the state mandated foundation funding amount in every district in the state. Thus, every district received some state aid to generate the necessary foundation funding and there was no need to consider what districts could or should do with surplus local funding generated by the 25 mills. However, due to increasing property tax collection in some districts and decreasing enrollment in some, a small number of Arkansas districts had the good fortune of surplus local funding. The first districts to experience this were Fountain Lake and Eureka Springs in 2007-08. During the first few years that these districts generated surplus local funding, the state of Arkansas viewed these excess local funds as state resources, collected them, and placed them in the state general education fund. However, in November 2012, the Arkansas Supreme Court overturned the state’s practice of collecting the excess foundation funding with the Kimbrell v. McCleskey decision and essentially returned these dollars to the districts in which they were generated. How much excess funding is collected in these districts? How did these districts find themselves in the fortunate situation of generating local revenue above and beyond the foundation amount? In total, how much money are we talking about? What’s going to happen in the future with this funding? In 2013-14, eight school districts collect excess URT funding: Armorel, Eureka Springs, Fountain Lake, Mineral Springs, Nemo Vista, South Side Bee Branch, Quitman, and West Side. In 2013-13, foundation funding amounts to $6,393 per pupil. The table below highlights the amount of excess foundation funding that these 8 districts will retain per pupil in 2013-14 and in total. Furthermore, the table explains how much additional funding these districts will retain this year, as compared to how much funding the districts collected in 2011-12 prior to retaining any excess URT funding. *In 2011-12, districts could not retain the excess URT funding; therefore, this percentage reflects how much additional funding districts are collecting in 2013-14, compared to the amount the districts collected in 2011-12. When the current funding system, constructed in response to the Lake View ruling, was implemented for the first time during the 2003-04 school year, no district in the state had a property assessment level that generated local funds equal to or above the foundation funding level, so all districts were entitled to state equalization aid. Since that time, however, a small number districts have generated excess foundation funding. 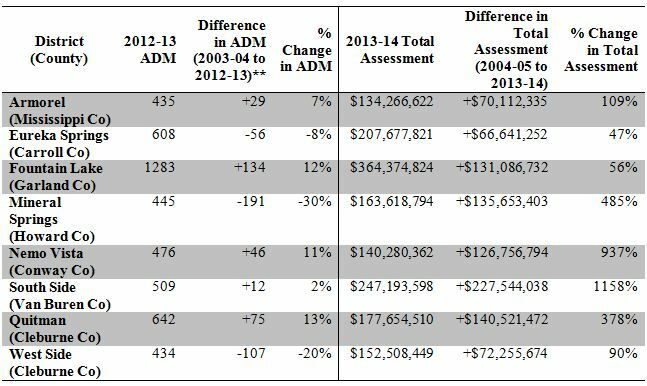 To examine the shifts in these districts that created this favorable funding situation, the table below highlights the difference in ADM (average daily membership) from 2003-04 to 2012-13 (funding is based on the previous year’s ADM) and the difference in the amount of property taxes (total assessment) collected from 2004-05 to 2013-14. Remember, the total assessment amount is not what districts collect — districts collect 98% of URT (25 mills) and 98% of funding generated from additional mills over 25 — however, it is important to show the differences in total assessment to highlight what happened in these districts over time since the local property value per pupil is a function of both the total local property and the number of students for whom these resources are to be spent. **Funding is based on the previous year’s ADM (average daily membership). As you can see, the eight districts are relatively small (the average district enrollment was 1,854 in 2012-13). Over time, the districts had slight changes in enrollment (statewide, on average enrollment decreased by 61 students per district). Three districts — Eureka Springs, Mineral Springs, and West Side — decreased in enrollment, while five districts — Armorel, Fountain Lake, Nemo Vista, South Side Bee Branch, and Quitman — increased in enrollment. Therefore, the excess foundation funding could be attributed to a decrease in students in three districts; but it is more important to consider the changes in the amounts collected from property taxes (total assessment). During this period of time, funding collected from property taxes increased in all districts. South Side Bee Branch and Nemo Visita school districts saw the LARGEST increases in property tax collected (the total assessed funding increased by %1158 in South Side!). The excess URT funding can be primarily attributed to these increases in property taxes. In 2013-14, due to excess URT funding, the eight districts will retain a total of $8,483,182. This funding would have been returned to the ADE previously; however, due to the court’s decision, it is now retained by districts. To put this amount of funding in context: in 2011-12, the state’s school districts’ total revenue was $5,204,120,992, and so projecting onto 2013-14 data, the excess URT funding will account for no more than 0.16% of total revenue in the state. Currently, the three districts that are closest to the foundation amount are Clinton (Van Buren County) which collects $5,185 per pupil based on the URT, Shirley (Van Buren County) which collects $5,528 per pupil, and Wonderview (Conway County), which collects $5,853 per pupil. 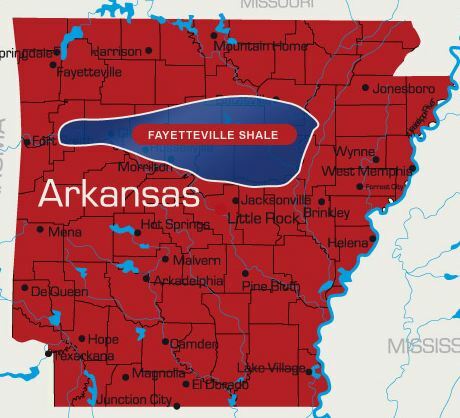 These three districts are located in north central Arkansas, where the natural gas industry has boomed. In the future, these districts may generate more funding based on the URT than the foundation amount, and if no laws are changed, these districts will retain that excess funding. As discussed in our previous blog post, last week, during the 1st Extraordinary Session of 2013, two bills (HB1010 and SB7) were discussed that would have allowed the Arkansas Department of Education (ADE) to retain excess foundation funding. However, these bills were highly contested — and in the end were dropped. In looking to the future, we believe that the issue of these funds may be brought up again … only time will tell.